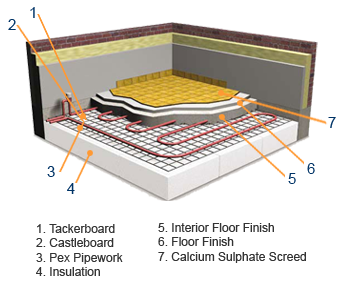 Under Floor Heating- How does it work? Warm water is pumped from you regular heat source through plastic tubing, at a controlled flow. This then warms your floor and heats your home. Whether your heat source is a conventional boiler or heat pump, we will supply a manual tailored to your specifications. We supply a complete package that is made up of components that are of high quality, including a full system design with bespoke CAD drawing and installation manuals that are award winning. With most floor finishes suitable for use over under floor heating systems, JH Lidstone are able to at install floor finishes that meet your requirements whilst ensuring that they are suitable for an under floor heated surface.